Crafted from hardwood solids and veneers, the media chest from the Rustic Lodge collection is sure to make an impression in your master suite. The chest features one open cubbyhole where media components are easily accessible, while three spacious drawers provide the perfect place to keep CDs and DVDs organized, or keep socks and pajamas tucked away. 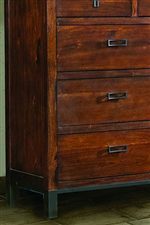 The media chest mixes rustic style found in its rich Acacia finish with contemporary coolness thanks to the no-fuss design and raised rectangular hardware. The straight-leg metal base of the chest offers an industrial vibe that is eye-catching. Kick back and relax at the end of a long day while surrounded by comfortable style with this media chest from the Rustic Lodge collection. 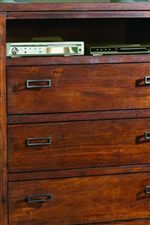 The Rustic Lodge Three-Drawer Media Chest with Open Component Cubbyhole by Vaughan Furniture at AHFA in the area. Product availability may vary. Contact us for the most current availability on this product.